As the Big Three U.S. automakers sputter in debt, automobile makers worldwide are speeding into the Chinese market in a race to win profits in the world’s fastest growing economy for cars. “You have to be here, and you have to be here in a serious way,” Dieter Zetsche, Daimler Chrysler CEO, told CNN. The auto world has descended on the Shanghai Auto Show this week. More than 600,000 visitors are expected to attend the six-day event, which includes 1500 automotive manufacturers and the announcement of 13 new models, including Porsche’s first four-door sedan, the Panamera. 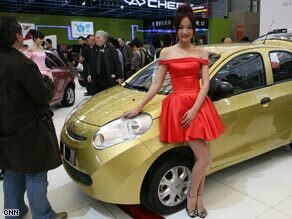 General Motors may be teetering on bankruptcy, but the one bright spot has been sales in China. Sales “are currently up 17 percent quarter on quarter, so we think we’ll do a little bit better than the market (average) this year,” said Kevin Wale, GM China chief executive officer. Though global car sales are expected to fall eight percent this year, sales in China are expected to grow 10 percent — and sales in the luxury market could be double that, according to industry analysts. Auto sales in China eclipsed the U.S. — traditionally the world’s biggest market — this year, selling 2.7 million passenger cars compared to U.S. sales of 2.2 million during the first quarter of the year. Last month alone, Chinese consumers bought more than a million new cars. It’s a far cry from China’s traditional image of a land of bicycles a generation ago. As more first-time drivers hit the roads, there are more carmakers from which to choose — China has more than 100 car manufacturers competing with Western companies, although industry analysts expect the Chinese automotive industry to consolidate as it expands. But for now, China is an open road for global carmakers.